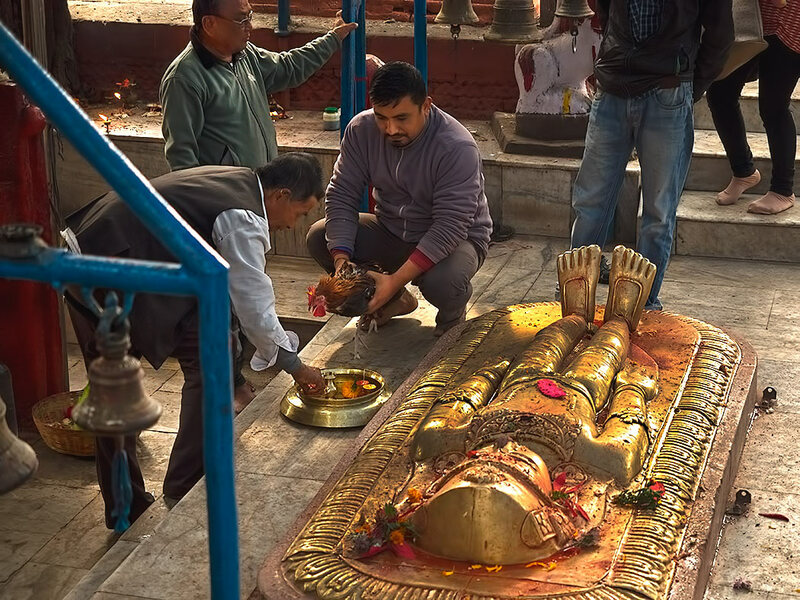 Click on title to view photo in large format: Hindu worshiper sacrifices a chicken at the Pachali Bhairab Temple on the Bagmati River in Kathmandu. Nepal is one of the few parts of the world where animal sacrifice is still practiced. Though in its purest form it is intended to relieve Hindus from the cycle of death and rebirth, animal sacrifice is more often used to appease demons that are believed to have great power, while simultaneously pleasing the deities. Most believe that sacrificing an animal at the altar of a temple also ensures that their prayers will be answered. Interesting to me that animal sacrifice is carried out by Hindus. Yes, it happens quite frequently, Bibi. Thousands of buffalo and goats are sacrificed every year during the Dashain Hindu holiday.